Drones will inevitably occupy our skies in the future, but how will we defend against them? In an ever-expanding market there becomes an increased threat from the misuse of technology. 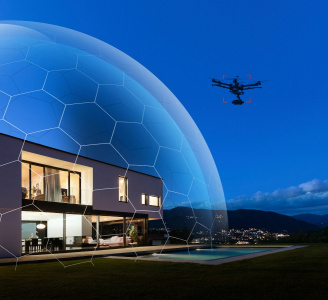 There is now an increased need for counter drone systems for a number of reasons, asset protection, anti-terrorism and privacy to name a few. Counter drone technology is now an expanding market within the drone industry and this document intends to outline the basic differences to enable buyers to source suitable systems that meet their requirements. The word RADAR is an acronym for Radio Detection And Ranging, and in its simplest form, it consists of a transmitted radio signal aimed by an antenna in a particular direction, and a receiver that detects the echoes off any objects in the path of the signal. A signal is sent out in short bursts of electromagnetic energy, called pulses, through the antenna which produces a narrow beam like that of a torch. Radar makes it possible to determine the direction to an object, generally referred to as the target, based on the direction the antenna is facing. The distance to the target is determined from the time taken between transmitting the pulse and receiving the echo. This can be accurately determined because the radar signal travels at the speed of light, which is constant. RF scanners detect, track and identify by scanning the electromagnetic spectrum and then identifying the specific transmission. Many RF scanners have the ability to also detect the type of drone in operation as well as the operator's location. Frequency jamming is the disruption of radio signals through the use of an over-powered signal in the same frequency range. Jammers are used to block both the 2.4GHz and 5.8GHz signals most commonly used in commercial drones. This usually forces the drones to either land or return to home. Spoofing is where technology is used to take over the drones GPS signal and effectively take control of the drone. There is a large number of different technologies used to destroy drones ranging from nets to birds. Always take legal advice from local law enforcement as well as the controlling agency of airspace in your home country. Some or all of these technologies may be deemed unlawful. Drone Major offers a comprehensive Counter Drone procurement consultancy service to enable you to understand what is possible with this technology, where to obtain systems to exactly meet your needs and how to implement them effectively. To find out more, contact us on +44 (0) 20 3950 1910, +44 (0) 20 3675 1882, email [email protected] or talk to an expert on our live chat, 24/7.